The Adoration of the Magi is a painting by the Italian Renaissance master Sandro Botticelli, dating from 1475 or 1476. It is housed in the Uffizi of Florence. 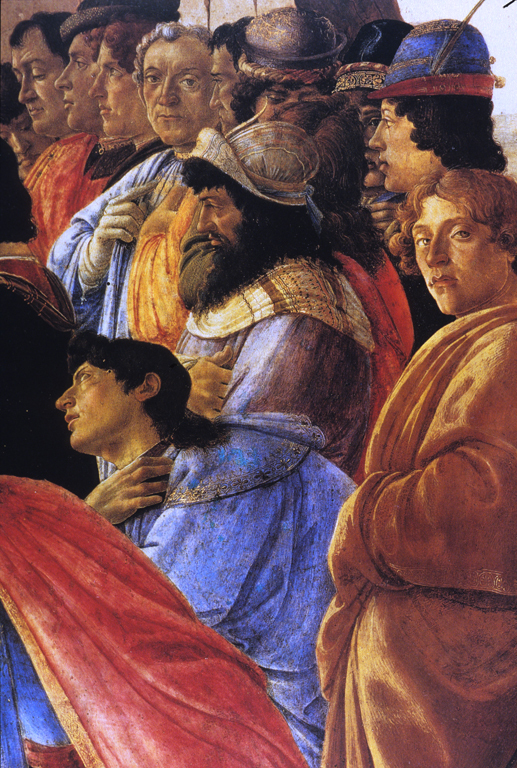 The Adoration of the Magi theme was popular in the Renaissance Florence. The work was commissioned by Gaspare di Zanobi del Lama, a banker of dubious origins and morality connected to the House of Medici, for his chapel in the church of Santa Maria Novella (now destroyed). In the scene are present numerous characters among which are several members of the Medici family: Cosimo de' Medici (the Magus kneeling in front of the Virgin, described by Vasari as "the finest of all that are now extant for its life and vigour"), his sons Piero (the second Magus kneeling in the centre with the red mantle) and Giovanni (the third Magus), and his grandsons Giuliano and Lorenzo. The four Medici portrayed as Magi were all dead at the time the picture was painted, and Florence was effectively ruled by Lorenzo. 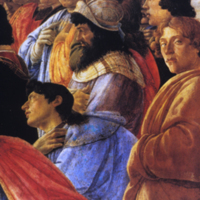 The young man wearing the yellow robe and looking at the viewer is alleged to be a self-portrait of Botticelli. Sandro Botticelli (Italian painter, ca. 1444-1510), “Adoration of the Magi,” Institute Images Online, accessed April 24, 2019, http://westerncivart.com/items/show/2720.